Manufactured with patented micro-foam nitrile, offering a durable & long lasting product. Designed to optimise the users comfort and flexibility whilst at work. Highly resistant to Abrasions, Cuts, Tears and punctures. Extra reinforcement around the thumb and finger areas for improved resistance. Ultra-lightweight seamless 18 gauge knitted liner with Dyneema® Diamond Technology and polyurethane palm coating. Polyco Dyflex Air Work Gloves delivering optimal grip, long duration and cut resistance on the palm, sides and fingers. Dyneema® yarn offers superior cut resistance for a lightweight work glove. Thin polyurethane coating in combination with the special fibre delivers EN388 level 3 abrasion performance for extended glove life. Close fitting and dextrous design allows for precision handling. Polyco Dyflex Air Cut Resistant Work Gloves conforms to: EN 388 3.3.4.2 standards. Matrix C3 is a seamless cut resistant liner with a PU palm coating. Offers outstanding fit and dexterity as well as Cut Level 3 protection. The glove is high abrasion , tear resistant and cut resistant. The seamless shell made from yarn with Lycra is designed to be close fitting giving the user superior dexterity. The polyurethane palm coating offers excellent grip which performs well in both wet and dry conditions. Designed and developed as a liquid repellent cut resistant glove. Seamless knitted comfortable cut resistant liner with micro foam nitrile 3\4 knuckle coating. The MaxiCut 34-504 combines cut protection with outstanding oil grip. The '2 layered' nitrile dipping provides increased resistance to penetration of oils and excellent abrasion properties. This glove is manufactured to be 'DMF free', REACH compliant and meets the Oekotex 100 standard. ATG Maxicut Oil Palm Coated 34-504 Gloves conforms To: EN 420: 2003 + A1: 2009 and EN 388: 2003 4.5.4.2 Standards. 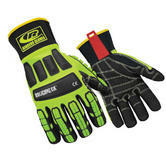 Lightweight cut-resistant glove, with excellent protection from dirt and oil. High level of grip allowing the user to maintain grip in any condition. Reinforced between thumb and forefinger for extra protection. Comfortable fit that moulds to suit the users hands. ATG MaxiCut Oil Palm Coated 34-304 Gloves conforms To: EN388 - 4.3.3.1 and EN407 safety standards. Lightweight and flexible whilst also providing effective protection. Resistant against oils, Abrasion, Cuts, Tears & Punctures. Flexible, light glove providing effective protection against cuts and very resistant to abrasion. 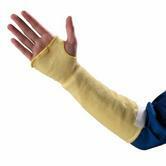 Protects the hand from oils and abrasion while remaining elastic and breathable. Manufactured to minimise allergy risks with materials. 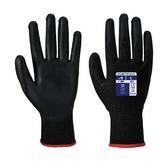 Showa 541 Cut Resistant HPPE Liner PU Coating Gloves conforms to EN388, Standards : 4.3.4.2. hands safety standards. Manufactured from polyurethane offering improved dexterity and flexibility. Designed with Dyneema fibres making these gloves cut resistant (level 3). Recommended usage in dry or slightly damp areas, ideal for glass handling. 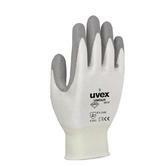 Uvex Profas UNIDUR 6641 Safety Gloves conforms to EN388 4.3.4.3 Safety Standards. Polyco MOP features a seamless knitted cut resistant liner with a polyurethane palm coating offering good mechanical protection, and is extremely lightweight and flexible. The open back style adds comfort and breathability, and the elasticated knit wrist provides a secure fit and serves to keep the hands free from dust and debris. Textured Polyurethane coating for enhanced grip performing well in both wet and dry conditions. Polyco Matrix Orange PU Cut Resistant Gloves conforms to: EN388 4.3.4.3 standards. Well balanced design delivers superior comfort and protection simultaneously. The liners used contains Dyneema which offers very high levels of cut resistance. Manufactured with a polyurethane coating improving the gloves overall flexibility. Ideal for Glass handling & general handling of sharp goods. 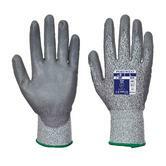 Ansell 11-625 Hyflex Palm Coated Work Glove conforms to EN 420:2003 + A1:2009 and EN 388:2003 4.3.4.2 Safety Standards. This professional work glove offers CUT 3 level protection, oily grip, flexibility, comfort and dexterity. High performance yarns and fibres offer cut protection whilst maintaining high levels of comfort. Skin friendly - The well-being technology eliminates all traces of process chemical and odours. 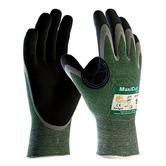 ATG MaxiCut Oil 34-305 Cut Resistant Men Work Glove conforms to: EN 388 4.3.3.1 standards. For superior mechanical protection and cut resistance. Constructed from paramid Kevlar fibres ensuring exceptional comfort and grip. Provides necessary protection, whilst maintaining flexibility and dexterity. Ideal for working in areas where cuts can happen on a daily basis such as glass repair or working with sheet metal . Ansell 70-118 Protective Kevlar Cut Resistant Sleeve approved to EN388 and EN407 1.3.4.X safety standards. Price refers to single sleeve. 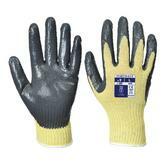 This Hghly visible glove provides excellent insulation and comfortable handling in cold conditions. Highly Resistant to Abrasion and Cut. Ansell’s PowerFlex 80-400 glove is a general-purpose glove that is designed to provide outstanding insulation from cold conditions, as well as high comfort and grip. This glove combines a thermal terry loop acrylic liner with a naturally insulating latex coating, ensuring excellent insulation against the cold. Additional insulation added for protection against temperatures as low as -30° C.
The well planned ergonomic design provides a superior fit, comfort, flexibility and dexterity. Ansell Powerflex Insulated Glove 80-400 conforms to: EN 388 0.2.3.1, EN 407:X2XXXX, EN 420:2003 A1:2009, EN 511 020 safety standards. The Portwest A635 Eco-Cut Cut Resistant Glove, a cut level 3 glove from the new Portwest Cut Resistant glove range. With all the staple benefits of comfort, dexterity and grip but at a very affordable price. CE certified Portwest A635 Eco-Cut glove conforms to EN 388 (3.3.3.1. ); EN 420 and EN 388 (4.2.3.1.C.X) safety standards. 13 gauge liner for a perfect fit. Low linting construction for minimal contamination. 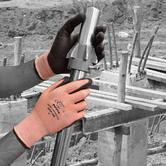 Flexible and lightweight Cut Level-3 protection glove - ideal for use in dry conditions. Amber colour indicates a medium cut protection level of 3. The tips of the thumb and first two fingers are exposed to increase dexterity. The ends of the gloves are factory sealed to eliminate the chance of any loose threads. The polyurethane coating is applied to fingers and palm to protect the area, the coating is also breathable ensuring comfort. Polyurethane provides good grip in dry conditions. TraffiGlove TG350 3 Digit Polyurethane Work Glove conforms to: EN388 4.3.4.3 standards. 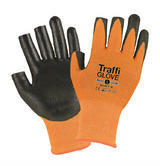 The TraffiGlove TG320 Forte Polyurethane Work Gloves are flexible and lightweight. Excellent dexterity and a close, comfortable fit. Ideal Handling Gloves for use in dry conditions, the perfect choice for most general handling tasks. A seamless knitted high performance, cut resistant thread liner. Polyurethane coating to the fingertips and palm to protect the area. Breathable Polyurethane coating ensuring comfort and provides good grip in dry conditions. The TraffiGlove TG320 Forte Polyurethane glove conforms to: EN388 4.3.4.2 standards. The Vending Cut 3 PU Palm Glove has been specially packed for vending machines. Seamless 10 gauge lining made from para-aramid, with Nitrile palm coating guarantees enhanced cut resistance and excellent grip. Ideal for handling glass, metal or other sharp oily objects. CE certified Portwest A600 Cut 3 Nitrile Grip Glove conforms to EN 420 and EN 388 (4.3.4.3.) safety standards. North Sea Workwear supplies cut resistant gloves ranging from the lowest, Cut 1 level, through Cut 3 and up to the maximum Cut 5 level of cut protection. Cut Protection 3 gives you the benefits of everyday cut protection without compromising the dexterity that high cut resistant gloves may have. Consider the Ansell Hyflex 11-518 Cut 3 gloves: these 18 gauge liner gloves are superbly thin, comfortable and light on your hand. Yet, thanks to the miracles of technology the 11-518 Ultrathins gives you full cut 3 blade protection. They are incredibly fine and super slim - you really do need to try them on to appreciate the benefits of how inobtrusive these cut 3 gloves are.